1:22 sold 25 stop 28 - that was a "hook and go"
12:57 coming to the Sun/Pluto timelines -hot 6 hours ago-now? 10:54 right at the Tide time-110 is at 1329-watching it's "curl"
6/20/2008 1:36:57 PM Mountain TG:: Enjoy your camping trip Al, sounds like a great thing to do. My wife is a ***** star hotel type of gal so I better keep trading well while your on vaca. 6/20/2008 1:31:09 PM Mountain Al:: Nice job, TG. I appreciate you and Ben sharing your insights, and I know the newbies do. 6/20/2008 1:13:33 PM Mountain TG:: Figured there'd be at least a good bounce attempt in the vicinity of 16. Now I'm too chicken to press my luck again on another continuation sell so far away from the 110 exma. Managed 10.5 points today on 3 trades, some were a little lucky, though. Best day I've had in a while so may just call it a day. 6/20/2008 1:07:26 PM Mountain TG:: Managed to sell 18.5 after move 6 up failed, out at 16, my original target. Maybe a lot of gyration coming before we get to Al's expectation of 14. 6/20/2008 12:18:16 PM Mountain Ben:: Great point TG. Thanks. 6/20/2008 12:16:41 PM Mountain TG:: Ben, there is still a move 6 up likely to come before a final move 7 down so most traders including myself would want to lock something of this move in instead of attempting to hold through a potential significant correction. 6/20/2008 12:05:45 PM Mountain Ben:: Al, since this is down into the close, are you going to ride this trade with a stop above the 55 exma? 6/20/2008 10:34:36 AM Mountain TG:: bounced nicely up from 2/3rds retracement of the move up off of the morning low. 6/20/2008 9:24:38 AM Mountain jh:: is this a buy? 6/20/2008 8:24:09 AM Mountain TG:: 1315 is 66.6% retrace, maybe that's the level. Show's up a lot in the intraday retracements, mentioned in Dr. Al's work a lot but not as well followed as the standard fib levels. 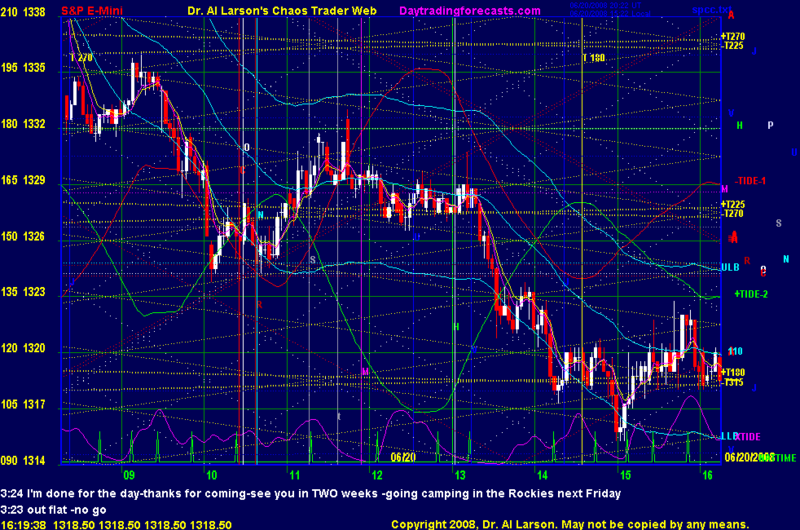 6/20/2008 8:04:14 AM Mountain TG:: 1324.8 is 61.8% retrace of 1253 to 1441 move. Been thinking we'd see that area as a low to bounce from for past few days. 6/20/2008 7:17:46 AM Mountain kc:: Please advise if the system is using ES M8 or ES U8?